Forgive us Barcelonistas if we gave Londoners a patronising smile as they waxed lyrical about the whole Boris Bikes scheme that seemed to have Brits in fits of ecstasy not so long ago. Here in Barcelona we’ve had a city bike scheme since 2007. I’m not trying to say that makes us cooler than them (well maybe a little bit), and in fact even us BCN-dwelling folk must doff our caps off to the residents of Amsterdam who first came up with the idea waaaaaaaayyyy back in 1965 (Google the Provo movement for more!). These days it seems every major city has one, from Montreal to Melbourne. Barcelona’s city bike scheme is called Bicing (pronounced “bee-sing”) and if you haven’t seen the red and white critters, either stationary at their, erm, stations, or on the move, then you must have been walking around the city with a labrador and white cane. They’re everywhere, kinda nifty and cool looking and it must be said damn practical. Simply turn up to a station hold your Bicing card up to the thingamebobby and then wait for said thingamebobby to alert you which number bike you can grab from the rack. After that you’ve got 30 minutes (I believe!) to make your journey and deposit your two-wheeled wonder at a different designated parade. Apart from a 45 euro annual fee for the card itself and charges if you spend longer than the 30 mins on a journey, the bikes are free and the fact that you don’t have to lock them up and worry about them (thieves are the plight of Barcelona!) makes them very handy. Are there any draw backs? Damn right they are! The biggest drawback, as far as travellers are concerned, is that you need to have a NIE number (probably need a separate post on that… but it’s an ID number for foreigners that requires a bit of running around to obtain) to get a Bicing card, which basically makes them inaccessible to the casual tourist. Although, if that happens to be you, then Barcelona is full of bike shops where you can hire bikes, so don’t fret! c) getting a really crap bike with no breaks and a saddle jammed so high only a giraffe could pedal it. d) station refusing to accept your bike, in which case you have to phone the non-English-speaking support staff and see what they can do. Cue practicing your Spanish! In mitigation a) and b) happen on rather predictable routes, so you should soon learn when to expect a surfeit / shortage of bikes on the stops you regularly use, and line up some back up plans, or allow for extra time on those journeys. For c) I saw the other day that you obviously have a short time limit simply to return the bike to the station and pick another one (some Catalan geezer tested the brakes of about five before finally driving off and letting me take the space he had vacated!). And d) doesn’t happen often. Having finally got my own card the other day I must say the pros are definitely outweighing the cons, esp. now as the summer is arriving and I don’t want to be stuck in the metro! As mentioned, if you are not eligible for a run on the Bicing system then simply rent a set of wheels and set forth. Barcelona is a fantastic city for biking around (flat, great weather, amazing districts!) and if you’re not sure where to go then there’s a gazillion backpacker-style companies that offer guided tours on two wheels – and even the odd hip alternative bike tour if you know where to look! Or why not go the whole hog and head off on a cycling holiday of Catalonia, maybe taking in Sitges (flat) and Montserrat (mountainous). Nothing like returning from your hols with thighs of iron. 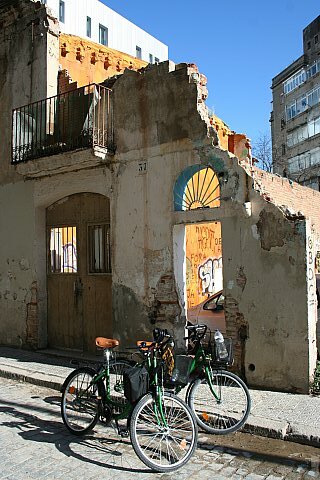 Barcelona’s First Alternative Bike Tours! Dear amigos, sorry for taking my eye of the blogging ball… been a bit busy recently getting a new project off the ground! Yep, after nearly a year slogging away as an impoverished travel writer/blogger I’ve decided to try and supplement my income with something that might actually get me away from my desk and into that fabulous Barcelona sunlight. 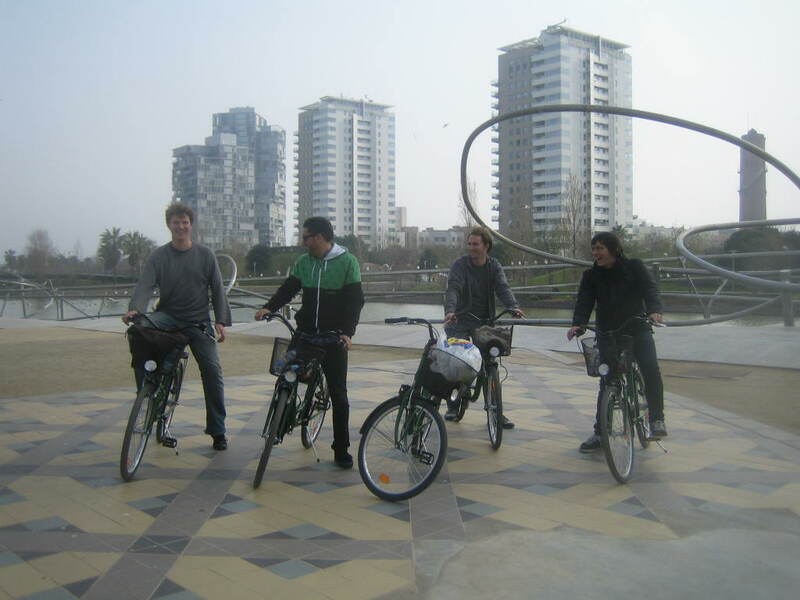 Naturally, being a lazy bugger, the criteria for any income supplementation couldn’t involve anything resembling real work and thus the idea of Barcelona’s first alternative bike tour was born! The concept is that, instead of taking a group of twenty wide-eyed college kids around the Gothic Quarter and Gaudi’s life works, I would focus on taking small groups of arguably more discerning tourists and show them some of the districts and sights that oft get overlooked thanks to the overpowering attractions of Guell and La Sagrada Familia – not to mention the beach! To begin with I’m focusing on Poblenou, and have spent the last several weeks reading up on the district’s attractions… and there are surprisingly lots of them! 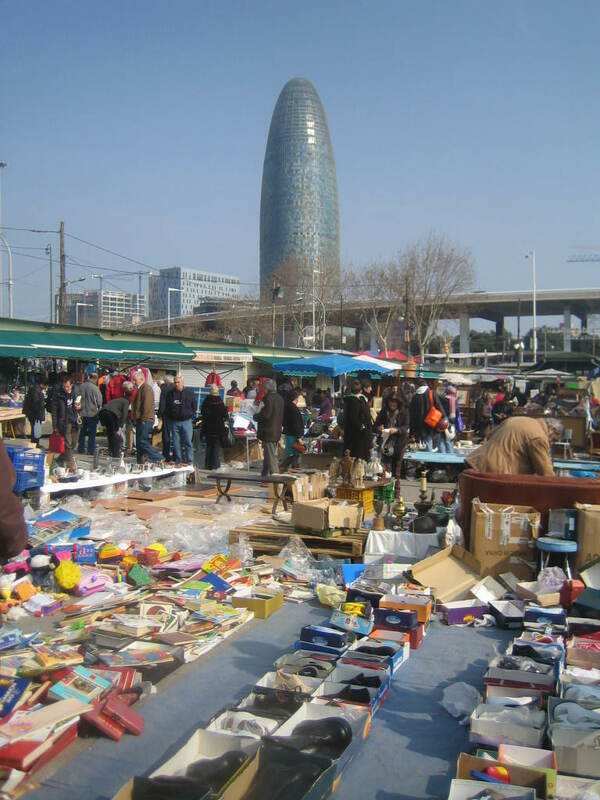 Torre Agbar is the obvious one, but the Encants flea market, Parc Central de Poblenou, Parc Diagonal, the amazing neo-classical cemetery and plenty of renovated factories from Barcelona’s industrial era means there’s plenty to see and talk about. And the simple pleasure of a pedal down Rambla de Poblenou shouldn’t be overlooked either! (Bikes really are the best way of getting around Barcelona, especially this large but largely traffic free district). Anyhow the website is up – Steel Donkey Bike Tours – named in part after the endangered national animal of Catalonia, the donkey (hoping if things go well we can raise some money and adopt some of the handsome fellas!) and the flyers are being printed as we speak. I ran a trial tour last Saturday with some friends and you can see the photos on our Facebook group… by all means become a fan! Our amigos at Barcelona Life have been kind enough to give us some great coverage on their bike tours of Barcelona article so we’re all set! If you have a blog and want to run an article about the tour, I can of course offer you a free (wheeling) sample. Just get in contact. UPDATE: These tours are now in the (far more) responsible hands of BCN.Travel, with awesome new itineraries run by local professional guides. The concept of a small group alternative tour remains though, so if you’re looking for a more behind the scenes, off the beaten path experience then check them out. The tours are also proving very popular on Tripadvisor, where they won certificates of excellence in 2013 and 2014 (and look likely to do so in 2015)!